Look What the Wind Did! I revisited my images from a New Zealand assignment and I came across this one. I took this on the second day of a two-day visit to Lake Tekapo, on New Zealand’s South Island. This is the iconic Church of the Good Shepard, which has been photographed every possible which way over the years by tourists, large format photographers, 35mm shooters, probably even pinhole aficionados. And no wonder. The church is situated at the edge of the lake, surrounded by a ring of snow-capped mountains. If there is a prettier church anywhere, please let me know! 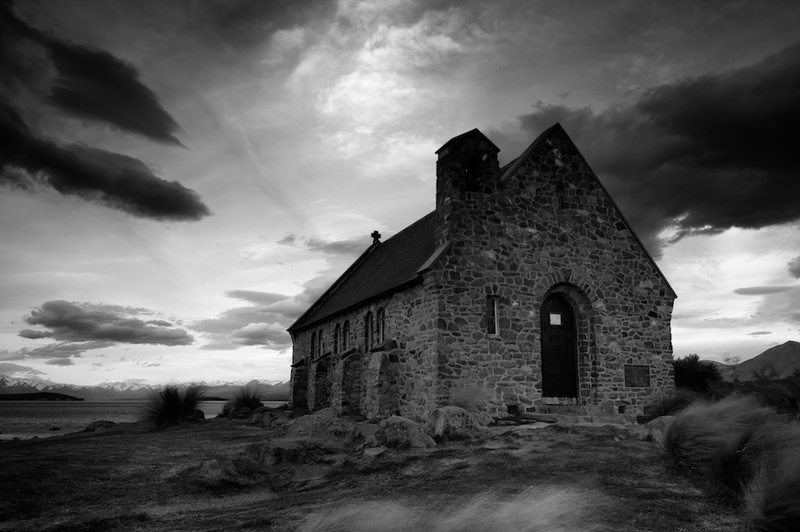 As I always do before a major assignment, I had developed a list of shots I wanted to take and in Lake Tekapo (pronounced Tee’-ka-po) I badly wanted a shot of the church at sunrise. But the weather did not cooperate. It had rained continuously on the first day and when I went out for sunrise, there was none. The day dawned gray, cold and miserable. To say I was frustrated would be putting it mildly. I mean, I came halfway around the planet and this was to be a go-to shot. To make matters even worse, the wind was blowing at gale force and a major storm was forecast. Now, some of my best images have come when the weather has been atrocious. In fact, I have learned to relish those opportunities, when other photographers pack up to await sunnier times. Not me. I have developed a system that allows me to stick it out as far as possible, often resulting in a winning photo. In this case, I braced my trusty Gitzo 3541 with Really Right Stuff BH-55 ball-head low to the ground and hung my 30 pound (14 Kg) backpack from the hook under the center plate to stabilize it further (I always carry an assortment of carabiners for that, and other, purposes). I composed the image the way I wanted, placing the Church off-center and emphasizing the threatening clouds. I always use a cable release when shooting landscapes on a tripod, so I stepped to the side and shielded the camera from the wind as well as I could. Then I actually slowed down the shutter speed, so I could capture the blowing grasses in the foreground, adding a painterly feeling to the piece. I like the resulting image, depicting the solidity of the church despite the storm, the angry clouds, the rim of mountains, and the softness of the grasses. Do you agree? Are there elements in the image you would have improved? Please feel free to be candid. I always enjoy another’s perspective.